Today’s pavements take a terrible beating. They broil in the summer sun and experience frigid temperatures in winter. Motorists overcrowd them and trucks overload them. Pavements serve until they fall apart, and then there’s not enough money to rebuild them. But it doesn’t have to be this way. The concept of pavement preservation—in which the right treatment to the right pavement at the right time forestalls or eliminates future high costs of reconstruction—is hitting its stride, and the nation’s road agencies are benefiting from it. Behind it, for over 25 years, FP2 Inc. has supported the spread of environmentally sustainable and economically beneficial pavement preservation principles to state, city and county governments, and the contractors who serve them. Pavement preservation methods prolong pavement life, avoiding high future costs of reconstruction or rehabilitation through the expenditure of lesser amounts of money for specific preservation treatments at critical points in a pavement’s life. These techniques include nonstructural preventive maintenance surface treatments such as slurry surfacings, crack sealing, chip sealing, micro surfacing, rejuvenation, hot and cold in-place recycling, and thin-lift hot-mix asphalt paving; and structural preservation techniques used in concrete pavement restoration (CPR). Pavement preservation makes scarce tax dollars go farther in keeping roads in top shape with a high pavement condition index (PCI), providing a great return on investment. Experience shows that every $1 spent on pavement preservation will save from $6 to $10 or more in future rehabilitation or reconstruction costs. In all of this, FP2 is an advocate for pavement preservation at the state, county, municipal and federal agency levels. We educate elected officials—and support legislative efforts—on Capitol Hill and in the state houses that encourage pavement preservation of federal, state and local road networks. We also support the National Center for Pavement Preservation (NCPP), regional pavement preservation partnerships and state-based pavement preservation centers to make sure the technology gets in the hands of those who need it. One of the hottest areas of pavement preservation this year is certification of agency and contractor workers. NCPP is managing this program, and an article from FP2 profiling this effort appears in this special supplement. New research also is coming from the FP2-supported preservation group experiment at the National Center for Asphalt Technology (NCAT) in Alabama and the Minnesota DOT’s Road Research Facility (MnROAD), as part of the NCAT Pavement Preservation Effectiveness Study. This research at NCAT and MnROAD is underwritten by FP2 Inc. and its funding partners of state DOTs, began in Alabama in 2012, and expanded to Minnesota in 2015. For the first time, quantitative data are being gathered on the performance of preservation treatments. The main implementable product will be life-extending and condition-improving benefit curves for treatments for low, high, and accelerated traffic in both hot and cold climates. Road agencies will then interpolate between these plots for their particular climate and traffic level. Today, FP2 is committed to the growth of pavement preservation. 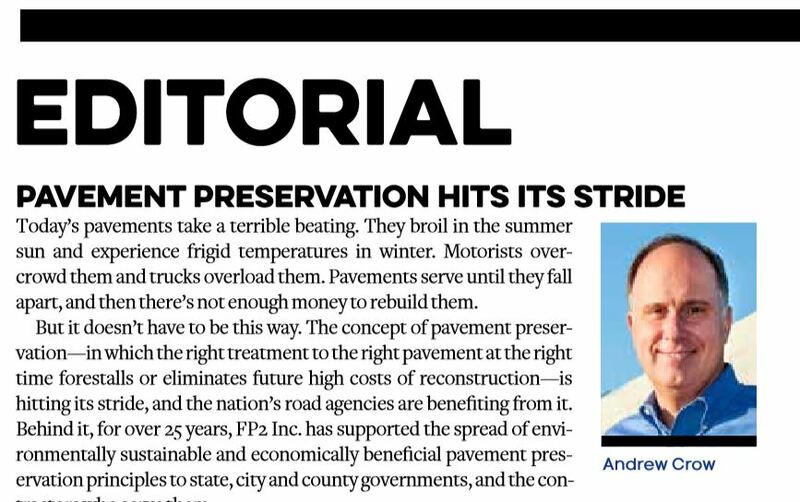 We salute AsphaltPro for putting pavement preservation in the spotlight in this special supplement, and we hope you will take the opportunity to learn more about pavement preservation and FP2 at www.fp2.org. Andrew Crow is vice president, pavement technologies, for Ingevity, and is 2018 president, FP2 Inc.